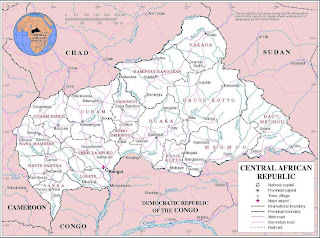 African Water Log: Merry Christmas and Happy New Year from the Central African Republic! Merry Christmas and Happy New Year from the Central African Republic! Since arriving in Africa this fall, we have settled into our new home in Garoua-Boulaï, Cameroon, a small town on the border with the Central African Republic (CAR). Most weeks, Joe spends Monday through Friday in the CAR as the technical advisor for PASE (the French acronym for Program for Water-Resources Development). Deborah home-schools Christa and participates in local church activities, such as the Femmes Pour Christ (Women for Christ) and a program for adolescent girls run by the Evangelical Lutheran Church of Cameroon. Recently, a Central African Joe knows came to his door in Baboua asking for money for medicine. He is one of the few who has graduated from high school. He wants to go on to the university to become a medical doctor, but he lacks the funds. Recently he has fallen on hard times. He can no longer drink bottled water, so he returned to drinking stream water and was sick as a result. Worldwide, 1.1 billion people lack access to potable water and 2.6 billion are without adequate sanitation. Statistics for water-related diseases in the CAR are difficult to find, although a recent report by the World Bank indicates that nearly 90 percent of all diseases in the developing world are caused by unsanitary water conditions and that 50 percent of the people in hospitals are there for water-related diseases. Diarrhea alone has killed more children in the last 10 years than all the people killed in wartime since World War II. In 2008, Joe will be working with PASE to continue improving access to potable water through rehabilitating broken wells and building spring boxes to protect the purity of the spring water. In January, Joe plans to meet with representatives of the International Red Cross in CAR's capital of Bangui to obtain educational materials in local African languages. PASE will be using these materials as part of their program to improve health and hygiene in villages through education. It is not enough to provide potable water; people must also learn why it is important to drink clean water, even it if means going a little further to a clean water source, such as a well or a spring. Please pray for the efforts of PASE, for its director, Jean Marc Abbo (a Central African Lutheran layperson), and for Joe as he serves as their technical advisor. This work, co-sponsored by the ELCA and its partner, the Evangelical Lutheran Church of the Central African Republic, has the potential to save many lives, and to spread the love of Christ to those living in poverty in one of the most neglected countries in Africa. Since we are using email via satellite, please do not send attachments, pictures, or forwarded messages. Please do not include our message in your reply. If possible, using plain text also helps cut the costs. Thanks!